There are many variations of charcoal cookers, ranging from mass-produced units under $70 to high-end ceramics over $1000. The general arrangement is vertical, which from the bottom-up has an air inlet damper, a charcoal-containing ring or drawer, an optional (sometimes water-filled) radiant barrier, one or more cooking grids, and an outlet damper. 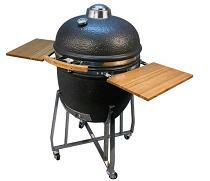 The charcoal cooker is one of the easiest-to-control pits. As we learned in How Wood Burns, charcoal is a benign fuel, being mostly carbon and oxidizing in a surface reaction to form CO and CO2. “Lump” charcoal is simply wood that has undergone pyrolysis or carbonization (heating without oxygen), which boils-off its volatiles, aromatics, etc. (the stuff that makes wood wood). “Briquette” charcoal is processed further, with the lump material ground, mixed with water, limestone dust and binders, compressed into uniform shapes and dried. In practice, there are usually some trace amounts of volatiles in charcoal, which is why a fresh charge of charcoal in a chimney starter will flame for a while. This fire’s power, and therefore pit temperature, is controlled by throttling air. As long as charcoal is the only fuel, there are no worries about creosote because there are no volatiles produced. Starving the fire of air reduces the reaction rate and heat production directly (see fire triangle). In addition to simple control, this property allows the pit boss to load his cooker with a large amount of fuel and achieve long, unattended burns, which is nice. A charcoal cooker will also make a smoke ring, with air as the nitrogen source (Thermal NOx). The major downside of charcoal-only fuel is taste, or lack thereof, which is why we’re going to all this trouble in the first place. CO and CO2 are colorless, odorless, and tasteless. That’s why nearly all charcoal cooker users add chips or chunks of wood to their fires – they are getting some volatiles into the system to impart flavor. Exactly what flavors they are getting is the question. You have your answer. Lots of folks like a dash of creosote for flavor – it’s the major ingredient in Liquid Smoke. But a little goes a long way. The minor downside of charcoal as a fuel is moisture, or lack thereof. A charcoal fire is bone-dry. Most manufacturers counteract this property by placing a water-filled bowl between the fire and the cooking grates to add moisture back into the system. Temperature uniformity – the compact, vertical nature of these pits generally brings good uniformity. Grease management – in a ceramic, the grease falls into the fire and generally smokes due to the lack of oxygen. The bullet-style cookers have an intermediate water pan to catch drippings, which is obviously cool enough as long as it doesn’t boil dry. Dampers – A number of aftermarket gadgets are available to control the air supply and pit temperature automatically, which converts a simple problem into a non-problem. 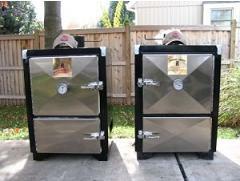 Airtightness – this is very important in a charcoal cooker. Leaks allow air to bypass the control dampers making power and temperature control difficult. Materials – the heavy ceramic and insulated versions offer marginally better fuel efficiency at huge cost in weight/portability. The ceramics are well-suited for grilling due to the refractory nature of their fire rings, which can make a very hot fire.